Since March 2011 the NSW Government has embarked on its mission to rebuild the state. They have created almost 110,000 new jobs, significantly reduced unemployment and invested $60 billion towards improving infrastructure and front line services. Building on this success, former Premier Mike Baird was delivering several projects across the state to further strengthen infrastructure, generate economic opportunity and promote social cohesion — Making it happen is one of these programs. Despite considerable work being completed, many across the State are still unaware of the activity that is occurring. 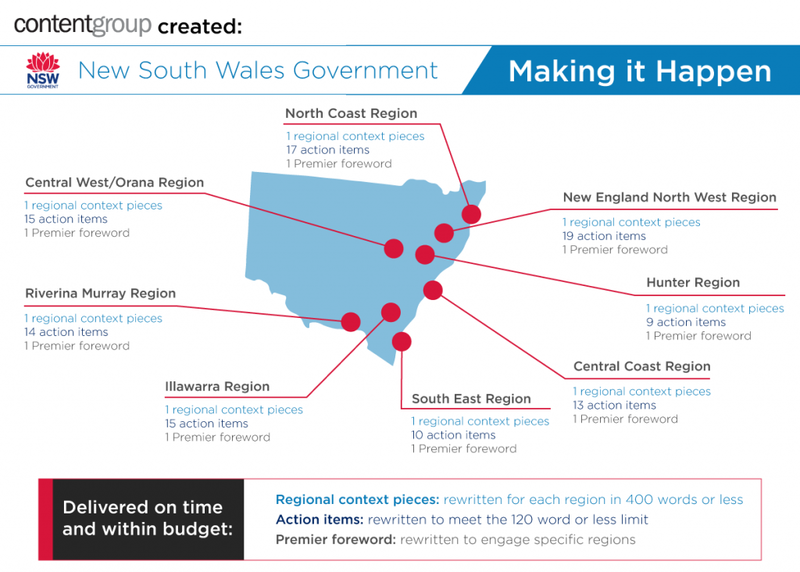 contentgroup was engaged by The Department of Premier and Cabinet engaged to edit and re-write a range of written materials for each of the State’s eight regions. These written materials were to be placed in eight regional specific documents for distribution across the State. Before we commenced our work, contentgroup had a series of discussions with the Department to set the frameworks around the project. This included establishing an audience for all the written materials, understanding the tone and style guide for the Department and setting in place firm project deadlines. contentgroup analysed and re-wrote close to 130 initiatives, using best practice communication principles—use of plain English, consistent tone and clear and defined purpose, objective and outcome. We also edited eight regional overviews and eight introductory paragraphs. All materials were delivered on time and within budget to the Department. As a result of our work, each of regional documents were approved by the Department of Premier and Cabinet and will be released in the coming months.